Wake Up The ACC has been sleeping on Jerome Robinson since high school. Will this be the year that he proves the conference wrong once and for all? Jerome Robinson hadn’t felt well when he went to bed, and it had only gotten worse throughout the night. It was 5 a.m. and he needed to puke, so he rushed to the nearest bathroom in Cheverus Hall and slumped in a stall. An hour later, he woke up in a cold sweat, returned to his room, and fell back asleep. He had three hours before 9 a.m. walkthroughs, and eight hours before a Sunday afternoon game against UMass Lowell. On the other side of campus, Dennis Clifford was experiencing the same symptoms. The senior center called head coach Jim Christian and told him that he wouldn’t be available for the 2 p.m. matchup with the River Hawks. Somehow, Robinson managed to roll out of bed, body aching, and limp down to Conte Forum’s Power Gym for the morning run-through. Barely able to move, the freshman huddled with a hoodie and a trash can on the sidelines. What he saw didn’t make him feel any better: Eli Carter, the graduate transfer point guard who led BC in scoring last season, injured his ankle during the warmup session. Just hours before tipoff, the Eagles had lost their only two non-freshman starters. Robinson knew how essential his presence on the court would be with the team’s senior leadership absent, so he made his way to Christian’s office and sprawled out on the couch to get some more rest, garbage can glued to his side. Four hours later, he got up and put on his No. 1 maroon and gold uniform. Despite the sickness, which would later be revealed as norovirus contracted on a team trip to Chipotle, Robinson took the floor with four other freshmen, two of whom had never started before, against Lowell. The last time this many first-year players had seen action in a game was in the early-season blowout of St. Francis Brooklyn, when Robinson gave fans one emphatic, convincing reason to trust the process. At first, their youth showed. Robinson opened the game with a turnover, then freshman Johncarlos Reyes turned the ball over, then freshman A.J. Turner completed the hat trick with a third consecutive giveaway. But then Robinson, crippled by stiffness and nausea, willed his body into rhythm. Down 9-7 early in the first half, the do-it-all guard suddenly took over the game, scoring or assisting on 14 straight BC points over the next four minutes. Robinson finished the half with 13 points behind 3-of-5 shooting from deep, including a three that beat the buzzer. Without much hesitation, the 6-foot-5 guard jogged off the court back to the locker room, hustled to the bathroom, and vomited. He was pushing his body to the limit. When it came time to take the court again for the second half, Robinson’s body was telling him no. Eventually, though, he emerged from the tunnel and subbed himself back in the game. Perhaps the extra motivation came from a special guest in attendance. His dad, Jerome, Sr., a former college basketball player who later played professionally overseas, had surprised him all the way from home. As much heart as Robinson showed by competing when most would have sat out, it wasn’t enough against the River Hawks and point guard Isaac White, who caught fire for 17 points in the final seven minutes of the game. Lowell’s 68-66 upset capped off an exhaustingly wild 12 hours for Robinson, during which he played with norovirus, felt the bodily consequences of it, and lost 15 pounds in the process. After the game was over, he slept for an entire day while his body recovered. It’s fitting, actually—Robinson has been a sleeper his whole life. Raised in a suburb outside of Raleigh, N.C., Robinson grew up in the heart of ACC country, and his household was split accordingly. His mom, Amy, is an avid Duke fan. Jerome, Sr. bleeds Tar Heel blue, but was also recruited by NC State for basketball. Robinson roots—well, rooted—for UNC, but also has ties to NC State through his friendship with Wolfpack head coach Mark Gottfreid’s sons. He often played pickup games with NC State players, including current Phoenix Suns guard, T.J. Warren. Despite being right under their noses, it wasn’t Tobacco Road that came knocking when Robinson transformed into a standout two-way guard at Broughton High School. 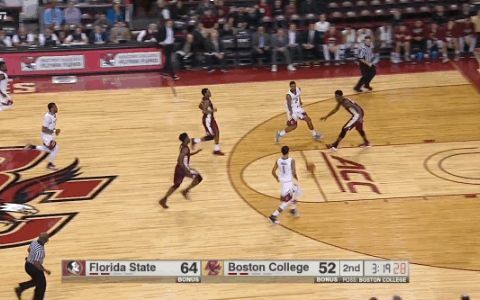 No, it was the ACC’s Ugly Stepsister From The Northeast, Boston College. Assistant coach Scott Spinelli made a recruiting stop to see Robinson, a self-described “late-bloomer,” and raved about the results to Christian. The third-year head coach was sold. The coaching staff described him, as many scouting reports did, as “underrated” with “a lot of potential.” Specifically, they hailed Robinson as a “cerebral player.” It’s really just a fancy way of saying he’s a smart player and a gifted decision-maker. The lanky perimeter playmaker, who is primed to thrive in an era of increasingly positionless basketball, has an analytical mind that comes in handy on both sides of the ball. Offensively, he reads defenders exceptionally well, passes the ball with the precision of a point guard, and has a knack for finishing, sometimes acrobatically, around the rim. Defensively, he anticipates his man’s movements and forces turnovers with active hands. Following the loss to Lowell, Robinson tallied nine steals over his next four games. It was this combination that prompted Christian to fly Robinson out to Chestnut Hill for an official visit. Robinson was done being a sleeper, and he certainly didn’t want to be buried toward the end of a stacked Blue Devil or Tar Heel roster. And so the North Carolina native made it his mission: he was going to carve out his own path in the ACC as an Eagle, 700 miles away from home, and show the rest of the conference what exactly they were missing out on. Brooklyn’s Barclays Center doesn’t have quite the history of its Manhattan counterpart, Madison Square Garden. It’s home to the Nets, Islanders, and Jay-Z, a trio that rivals MSG’s Knicks, Rangers, and Billy Joel. But in terms of legacies, the Barclays Center is still a toddler, only five years old, while the Garden is the granddaddy of them all. Nevertheless, the setting is enough to give any college basketball player butterflies. For Robinson, though, BC’s clash against Fordham in New York City was mere child’s play. Bred in an environment in which amateur basketball rules everything, he learned how to deal with pressure from a young age. During his sophomore year of high school, his varsity basketball team at Broughton qualified for the state tournament and won its first three matchups. The Capitals continued their dominance and beat Hillside in the quarters, then topped Seventy-First in the semis to earn a berth in the championship game. Robinson’s squad would lose out on the state title to Olympic, but he still got a taste of the big stage. By his senior year, the McDonald’s All-American nominee had developed an insatiable appetite. When Broughton hosted rival Millbrook in the championship of a 2014 holiday tournament, Robinson carried the hopes of thousands of fans on his shoulders. Students packed into the high school gym, selling out the title game more than two hours before tipoff, to watch their favorite scoring sensation put on a show in a 78-74 win. It won’t come as a surprise, then, what happened last year when he took the Barclays court against Fordham, just two weeks after the norovirus nightmare. Robinson established himself as the best player on the court, even without his usual lethal perimeter shooting. After starting the first half 0-for-3 from behind the arc, he maturely recognized his own limits, abandoned his 3-point shot altogether, and shifted his focus to finding ways to score in the paint. With Fordham storming back to within two possessions late in the game, Robinson drained two free throws with 30 seconds remaining to seal it. Robinson led the Eagles in scoring with a season-high 19 points and six rebounds as they outscored the Rams 28-14 inside. He added three steals in the victory, BC’s best all-around defensive effort of the season, holding the Rams to only 55 points and snapping their nine-game winning streak. At the helm of the lockdown defense was Robinson, who prevented one of the nation’s best three-point shooting teams from breaking free for open looks. He stayed glued to his defensive assignments, forcing turnovers and disrupting any pick-and-roll offense. It was a brief, 40-minute teaser of what the future of the program might look like if Christian can surround Robinson with athletic recruits who wreak havoc with on-ball pressure and run fast breaks with the ease of an up-tempo offense. It also marked a key milestone in his metamorphosis from sleeper to star. With his seventh double-digit scoring effort in his first 12 collegiate games, Robinson was sending a message that he was done being overlooked. Nothing, not even a graduate transfer point guard that demanded more touches than Kobe Bryant in the final game of his career, was going to stand in his way. But if Robinson thought success in non-conference play meant success against the top teams in the ACC, then he was foolish. The next step in his basketball career would be the steepest, most difficult one yet. Jerome Robinson isn’t a volume shooter—at least he wasn’t last year, anyway. That role belonged to Carter, who should really be exclusively referred to as Tha Carter III. He took one-third of the shots on a team that ranked toward the bottom of the country in offensive efficiency. Meanwhile, Robinson ranked ahead of all conference freshmen in field goal percentage. Never was this contrast between BC’s two leading scorers clearer than against Florida State, in the team’s seventh ACC contest of the season. Carter needed 18 shots to make six buckets. Robinson needed just 10 attempts to register the same. This time, he had his 3-point stroke, too, finishing 3-of-4 from downtown to supplement Carter’s 3-for-10 effort from deep. His performance was no anomaly. It echoed his outing against No. 15 Miami six days prior, when Robinson poured in a career-high 20 points on 9-for-14 shooting. Now, with a string of impressive performances against elite ACC schools, it was impossible to sleep on Jerome. But then, in the blink of an eye, Robinson’s season was derailed—not by a hard foul or a rolled ankle, but by a dunk. The 10-foot free fall from rim to floor took a toll on Robinson’s right wrist. The diagnosis was crushing: the breakout freshman scorer would miss up to six weeks with a broken wrist. The timing couldn’t have been worse. Not only had Robinson just hit his stride, but the Eagles had lost their first seven conference games, and the most turbulent stretch of their schedule was ahead of them. To make matters worse, Turner also went down with an injury days later. BC was slated to visit No. 1 UNC, No. 12 Virginia, and No. 14 Louisville on an upcoming road trip that threatened to send the season into utter disarray without its two best freshmen. Unsurprisingly, the threat soon became a reality, and the losing streak reached double digits. The streak became a storyline in itself, as a blowout loss to lowly Wake Forest pushed the winless stretch to 14 games. Tired of watching helplessly from the bench, Robinson accelerated his recovery process and made his return to the court with Turner for the second-to-last regular season matchup against NC State, on the same court that served as his second home while growing up. Both youngsters filled the stat sheet, including 13 points, six rebounds, and four assists for Robinson. The resurrection of Christian’s youth movement prompted the Eagles to play their most competitive conference game of the season against the Wolfpack. With 14 seconds left, in front of his hometown fans, Robinson hit a free throw to give BC a 72-71 advantage. But as with most stories of BC Athletics over the past year, the ending was far from fairytale. NC State exposed a defensive miscommunication on an inbounds pass and snuck in a layup to beat the buzzer. 73-72, Wolfpack. The streak lived on. When all was said and done, the Eagles had dropped their final 19 games of the season and finished 0-18 in the ACC, the first program to do so in three decades. In Robinson’s first season in the ACC, his team went winless and injury kept him off the court for a big portion of the regular season. It wasn’t exactly the I-told-you-so memo that he wanted to deliver to the conference. But even in a season cut short by injury, Robinson’s impact was felt across the league, the silver lining in an otherwise extraordinarily dim year. He recorded four games of double-digit scoring and over 50 percent shooting from the field in only nine regular season ACC games. By comparison, Brandon Ingram, Duke’s consensus ACC Freshman of the Year and No. 2 overall draft pick, logged five such games in 18 regular season ACC games. Most importantly, he proved that he was no longer a sleeper. He didn’t just show potential. He wasn’t going to be good in a few years. He is competing at an All-ACC level now. That’s why Christian and Co. are so confident that 2016-17 is the season in which BC shakes its demons. The coaching staff has handpicked a supporting cast for Robinson, now a sophomore, featuring dynamic two-way players that can run the floor and play with a fast-paced style. Gone are the days of contested Carter 3s early in the shot clock, or post-ups to Clifford. Rather, the offense will whip the ball around the perimeter, looking for any openings that shifty guards like Robinson or newcomers Ty Graves and Jordan Chatman can exploit. Transfers Connar Tava and Mo Jeffers will provide answers to an Eagles interior that was left with serious depth questions after Clifford’s departure. And the addition of Kyran Bowman, a former UNC football recruit who flipped his commitment late to switch to basketball, could make BC’s unit of perimeter defenders one of the best in the conference. Christian will unleash his pack of physical, raw, and at times undisciplined underclassmen on full-court and half-court presses in an attempt to force mistakes and fuel transition basketball in the open court. In last week’s exhibition game against Stonehill, Robinson dropped a whopping 27 points on 10-for-22 shooting, picking up the slack for a lineup that occasionally looked lost without a score-first guard like Carter. There’s a fine line between being the No. 1 scoring option and being a low-percentage, high-volume shooter, and Robinson will tiptoe that boundary this year. Once again, Robinson’s basketball identity will be challenged. Questions linger about a team very much still in rebuilding mode. Will Robinson devolve into a less efficient scorer? Will Christian’s defensive-oriented squad be able to put up enough points each night? Will the pressure defense be able to create turnovers against some of the best teams in the country? Will Robinson attempt another risky dunk—and he’ll have plenty of opportunities to do so on fast breaks—in transition over his opponent? Unfortunately for BC fans, those answers will have to wait until Friday, when the Eagles begin their regular season with a home-opener versus Nicholls State. Until then, though, Robinson only has a hint for the final question. If you thought he would shy away from posterizing his defender because of some injury he suffered last season, then you don’t know Jerome. “I’ve dunked on people since then,” he said with a slight smirk. Hell, if diarrhea-inducing, vomit-triggering norovirus can’t keep this kid off the court, then not much will.